Ying yang couples gold pendant can be found searching under yin yang. Many people confuse the spelling of this phrase by placing the letter "g" on the end of both words. Yin yang is the proper spelling. 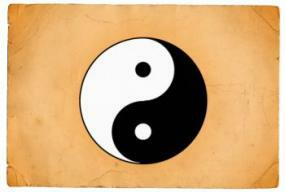 The yin yang symbol is a depiction of harmony existing between opposites. The yin and yang - female and male energies govern chi energy. The two opposites when joined together form a whole. To purchase a pendant that is correct in its Chinese symbolism, make sure that the black portion is on the right and the white is on the left. This is just one of the things that is often incorrect in modern depictions. The significance of this placement is because the white represents the male energy (yang) which is located on the left and the female energy (yin) is black and located on the right. If you find it difficult to remember, you may have heard it said that the division of your physical body has a male and female side. The left side being male and the right side being female. The two teardrop shapes have specific directions that symbolize the process of achieving harmony or oneness. The white teardrop ascends while the black one descends. That means the tail of the white teardrop is in the lower position while the bulb of the shape is at the top of the pendant. The black side (right) descends with the tail at the top of the pendant and the bulb at the bottom. This creates a clockwise pattern that represents the constant motion of change. The circle that these two opposites create in their search for oneness establishes a balance of energies when working in harmony. You and your lover may have decided to express your love and commitment to each other by buying matching jewelry. Deciding on gold pendants depicting the yin-yang symbol is an excellent choice since it symbolizes the balance of male and female energy. Before you begin your search for pendants, you need to decide if you wish to have matching pendants or prefer a puzzle pendant where you wear half and your lover wears the other half. You can find both kinds of these pendants online but locating a puzzle one in gold may prove challenging since most of these are available in steel or sterling silver. The nature of this sign means most pendants aren't gender specific and can be worn by either a man or a woman. Some pendants, however, maybe be designed with a woman in mind, featuring diamonds and gemstones or created with a feminine design. The majority of those on the market, however, are attractive when worn by either a man or woman. Once you find the pendant both of you like, it's easy to purchase two so each of you has an exact duplicate. If you don't mind that your pendants don't match then you can opt for a feminine one and a masculine one. You may wish to make your pendants extra special by engraving your names on them or a favorite saying or mantra. You could also choose to engrave these in a language other than your own, for instance, you could have your names written in Chinese on the back of the pendants. While giving each other token gifts of matching pendants is an outward sign of your commitment to each other, by engraving the backs of your pendants, you'll be creating unique gifts not found anywhere else, just for the two of you. There are several kinds of yellow gold that you'll find while searching for the perfect yin yang pendants. Some come in gold plated, 10kt and 14kt. You may find a few that are 18kt and 24kt, but be prepared to spend more for these since the gold content is higher than normal. If you prefer silver over gold, but wish to have a gold pendant, then you'll enjoy a white gold pendant. It gives you the silver look but with the weight of gold. The same quality of yellow gold is available to you in white gold. Check the item's description to see if it's offered in white gold. There are many places you can go to find your pendants. Below are some online stores to get you started in your search. 14kt Gold Black Onyx and Mother of Pearl: This pendant is also available in jade and mother of pearl. 14kt Gold Enamel: This pendant is 11mm (.43") L and 13mm (.51") W.
14kt Gold Green Jade and Mother of Pearl Pendant: This pendant is 1" L by 3/4" W.
14kt Gold Red Jade and Mother of Pearl: This pendant is 3/4" in diameter and features hand-cut stones. 14kt Gold Lavender Jade and Mother of Pearl: This pendant is 1" in diameter. 14kt Gold Turquoise, Lapis and Mother of Pearl: This inlaid pendant is 1 1/16" L and 5/8" W.
The yin yang symbol is the perfect one for couples. Whenever you gift your lover with the yin yang couples gold pendant, make it a special moment that each of you will remember.